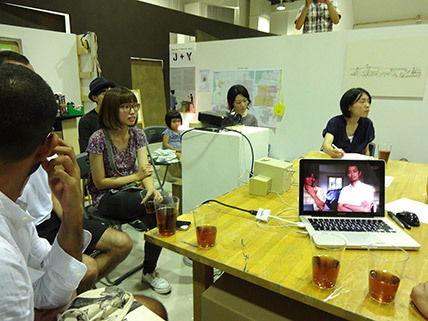 As part of the regular events held at HHS, Yokohama, Youkobo Art Space joined via skype with artist unit "Mouhitori", who were joining a 1 month residency at "Utopiana", a residency based in a residential area of Geneva, Switzerland, the two artists Tamaki Ono and Kiyohito Mikami speaking directly of their experiences. While in the final 10 minutes Utopiana's director, Anna Barseghian, also joined the conversation, sharing further details about the residence and highlighting the similarities in scale and context of both residencies. The session began with a video tour via skype of both spaces of Utopiana and HHS. Following this the participants entered into dialogue regarding the residence program encompassing topics of the history of squatting, the environment of Geneva and the management of the Utopiana garden through the participation of the local community. This was followed by commentary by the residence artists Tamaki Ono and Kiyohito Mikami on the result of their 1 month stay. The conversation also extended to issues of climate change and environmental challenges, touching upon melting glaciers and the taking over of weeds like Canada goldenrod. The artists also talked of their trip to the Venice Biennale and the necessities of self-catering in a country with such high prices. Lastly Anna, the founder of Utopiana, who is originally from Armenia, explained the development of the art space since its establishment, while Youkobo shared its own progress and introduced the activities surrounding its microresidence research. In fact by coincidence Youkobo is planning to welcome an artist to its space in February 2014.